The next important contribution was in Meteorology, by Edward Lorenz in 1963. By introducing a number of simplifications in the Navier-Stokes partial differential equations, he arrived at a version with three simple ordinary differential equations, further reduced to first return maps, which he studied by the help of a digital computer. Having interrupted a very long computation, he later resumed it from a point mid in the simulated process, but with a very slightly different number of significant digits as input, and was puzzled by the completely different outcomes of the two simulations. 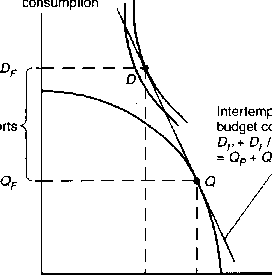 He then focused his study on this divergence phenomenon, and concluded that the sensitive dependence on initial conditions made the system unpredictable. The revolutionary conclusion was that weather is unpredictable, except for very short periods. There is no point in making long run forecasts, because after a while the disturbance to atmosphere, even if caused by a butterfly flapping its wings, would be as big as that caused by a volcanic outburst or a nuclear bomb test. We can expect to be able to take major disturbances of the latter type in account in the calculations, but we cannot aspire to keep account of every butterfly. This should have put an end to Richardson's fantastical aspiration, but Lorenz's contribution had practically no effect for ten years. The paper was too mathematical for his fellow meteorologists, and the mathematicians, who both would have been interested, and been able to understand the contribution, did not have the habit of reading the Journal of Atmospheric Sciences where it was published. The lesson to learn from Godel, Poincare, and Lorenz is that we should not believe in superscience visions of a Laplace, a Comte, or a Hilbert. Perfection and absolute progress become as dubious in science as in the arts, and we are led to believe even more in Kuhn's paradigm of a taste driven development. Fig. 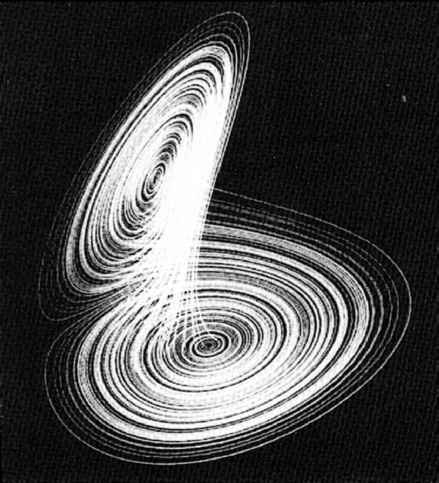 5.3: The Lorenz chaotic attractor. In this three-dimensional picture, a moving point traces a curve which spirals inwards around one of the eyes of this "mask" for an irregular number of times, then suddenly jumps out and is immediately caught by the region around the other eye to start the same process again. This goes on for ever and ever and produces a chaotic trajectory. Starting a simulation of this process anew, no matter how close we take the starting positions, produces an entirely different time series, though the object of the mask itself is always traced, no matter how we run the system. The mathematical system is a much simplified version of the equations that govern the movements in the atmosphere given the conditions for convection and heat diffusion. The unpredictable character of these trajectories is the reason why weather forecasts can be made for at most five days.